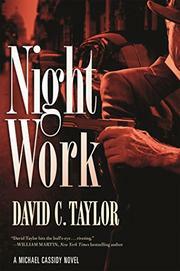 Taylor’s criminal traversal of the 1950s leaves behind J. Edgar Hoover (Night Life, 2015) to focus on an assassination plot against newly hatched dictator Fidel Castro. How new is Castro? So new that the FBI isn’t yet sure that he’s a communist, though they certainly have their suspicions. So new that in the first act of this tale, which seems to have been inspired by The Godfather, Part 2, he’s still leading a ragtag band of guerrillas while NYPD Detective Michael Cassidy sits uneasily in Havana, partly because his work detail—returning a triple murderer to Cuba to stand trial—hasn’t exactly turned out as he expected, partly because a routine trip to deliver his cargo to the prison La Cabaña has given him a glimpse of his forbidden love, KGB agent Dylan McCue, along with a hint that she’s about to be executed. Naturally, Cassidy has to bust her out, and naturally, he does, with some reluctant help from Sen. George Smathers, who’s visiting from Florida on a fact-finding tour heavy on drinking and wenching, and some crucial post-breakout assistance from artist Carlos Ribera, a Castro sympathizer. Back in New York, Cassidy and his partner, Detective Tony Orso, are assigned a new homicide—an anonymous corpse tied to a chair that’s been placed on display at 72nd Street and 5th Avenue—only to be yanked off it to serve on the task force that’s been pulled together to protect Castro’s life during the new leader’s unofficial visit to New York. This part of the tale lifts a scene flagrantly from the first Godfather film, but Taylor adds enough false leads, double-crosses, assassins taking down other assassins, and felonies compounded by the good guys to make it his own. Sturdy, studly historical cop drama that’s not as smooth or playful as Elmore Leonard but a good deal more accomplished than Max Allan Collins.